Although it has evolved since, the Apache Isis framework started out as an open source implementation of the naked objects pattern. Indeed, the generic user interfaces provided by Apache Isis Wicket viewer and the Restful Objects viewer are both "just" naked objects implementations; the first serves up a default generic representation of domain objects for human interaction, the latter serving up representation intended for machine consumption rather than human beings. If the idea of naked objects is of interest, then there are a couple of books on the topic that you might want to read. This book describes the original ideas of Naked Objects. Although based on a very early version of the framework, it’s still definitely worth a read (and beautifully produced). The book is freely available online here. Or, you can get a hardcopy of the book at Wiley (publisher) and Amazon. 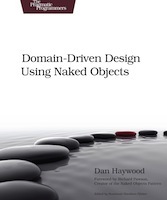 This more recent book draws the parallel between domain-driven design and Naked Objects (4.0). In the spirit of the Pragmatic Bookshelf, it’s a practical, hands-on sort of book, building up a case study as it goes and encouraging you to build your own app as you go. You can find the book at Pragmatic Bookshelf (publisher) and Amazon. The Restful Objects specification defines a set of RESTful resources, and corresponding JSON representations, for accessing and manipulating a domain object model. This is a comprehensive specification, running to over 200 pages in length. It is implemented by Apache Isis' Restful Objects viewer, and is also implemented by another (non-Apache) open source project, Naked Objects MVC.